Someone completely intrigued by the transformative power of Christ. Someone determined to explore and extrapolate all possible positive outworkings of the power of the gospel of Christ. I am interested in power. I know nothing more supreme or more commanding and worthy than Chirst, the most magnificent power. The true king, forever. Humble human interested in summoning and fueling a gospel vortex. May it become blinding and incredibly obvious. May we all be claimed by the rejuevnating light of Christ! A thunder crack across the scene! What holy might commands us thus? What stops creation in its tracks? What can we do with such as this? Wherefore our views and sentiments contrasting? Wherein the need to wrangle thus? Your problem, now and in the near future, is your connection to Adam. Part of you resides in Adam, is housed in Adam, is tethered, through time and ages, to Adam. The spiritual inheritance, by this ineluctable line, is unsightly and unpalatable, the aftermath stupendous. We are univerally and monumentally afflicted. We have corruption and rebellion hard wired into our constitutions, we are riddled with anger and shame, our relationship to the universe is grossly compromised, and as a consequence we have become utterly expert at running from the light to deny and numb this reality. We shy away from ourselves and others with gusto, as the reflection we see bears the disturbing imprint of Adam. These woeful hallmarks of our experience may seem obvious and plain, but I want to commence with the assertion that they are specifically traceable to our fraught and binding spiritual link with Adam. We have the intuited dismay of heaven in conflict. With that place in the heavenlies intended for Adam having been usurped, overwlemed and despoiled by the devil, we have resultingly a grinding and interminable blot in our spiritual vision. We have a snag, a blind spot, a thorn, a travesty in our midst, a sense of reality gone awry, a sense of inner wrongness. Adam was supposed to command spiritual authority by Christ, according to Chirst, and always under the light of Christ. Poise in Christ is what slipped. Indeed, it is the Christ-centred character of God-given authority that was jeopardised; this is the real root of the problem. This is what was undermined. Light which should be there is not there. The cloaking cherub, which should stand proudly within us as bright Lucifer, recoils into a snarl of willful non-compliance and self-exhaltation. Hence, our pronounced impluse for self-assertion and self-aggrandisement, our drive to dominate and violently overpower others, our inability to cooperate. Yet, be this as it may, we are still bound to Adam, with all his compromised authority and evident failure to exhalt and reveal Chirst. This connection to a faltering spiritual father is the problem. This inescapable relation to Adam is the nexus that sees the whole creation groaning. This is what has us mired in futility and conflict. The disturbed heavenly structure in Adam manifests through time with terrible consequences, in perennial and ugly dissonance. We are ravaged by war, disease, famine, greed, corruption, shame, depression, isolation, unhappiness, murder, strife, pain, emptiness, desperation, neglect, addiction, the need for approval, the need for escape, and, most pointedly, self-doubt. This is an eerie yet accurate portrayal of our character in impotent Adam, a God-crafted parable that plays out through time, over and over again, until the end, until such time as Adam is able to prop up and worship the lamb of God, Jesus the Chirst, as he should. We are accustomed to assigning blame to individuals for things gone wrong. Really, we are collectively accountable for our condition, and for all repurcussions and all consequences we face. Though we inhabit many multitudes of bodies, we are one man and one woman in heaven. We are one in Christ, who owns everything and everyone. Being one organism, we own and share all problems and conditions as participants in the heavnly space. We exert and derive our experience within and from heaven, a shared spiritual environment, which creates a material and physical expression on earth. Thus, with heaven under the strain of an ineffectual spiritual ancestor, with heaven lamenting the case of a sadly compromised leader, we have the agonising parables and pictures of our disunity materialising as a daily event. We are all responsible for what happens, for these pitiful dramas that play out, since we are one thing, existing always and emphatically in a state of mutual implication. The problem illustated above, with all its multivarious and sickening outworkings, is already solved, but not fully translated to extant reality. Assuredly, the widespread dissaray we see today is divinely ordained as an accurate portrayal of our state. To be absolutely sure, the problems and dramas we continuously witness are, at once, necesssary and unnecessary, indeed a smarting and excrucisating paradox; necessary for us to comprehend our degree of dissociation from Christ, and unnecessary because, if we accepted and honoured Christ collectively, all pain and disorder would inevitably dissolve. The situation is confounded, but intrinsically brimming with hope. As long as we tarry with one foot in Adam, we are destined to remain in turmoil. What we are looking for is a new residence, emancipated from the untoward influence of Adam deceived. The solution is a new house, which we have been assigned, which we have the keys to, but which we have not moved into yet, because Adam has not moved in. He will be making this shift and changing address very soon, I predict, quitting the tired malaise of a defiled existence in the snares of the evil one to embrace a brave new situation in the shining palaces and mighty compartments of the Body of Christ. The arrival of the Kingdom of God has been trumpeted from above, at Calvary C.E. 33, as is slowly and surely awakening to our sight, by way of experiential conflict and suffering. The end of days might as well be called moving house. It’s nothing more to get excited about than that. If all the fervour, excitement and melodrama is factored away from this topic, what we have fundamentally is a journey to a new and more seemly suburb in heaven, a positive sea-change governered by the conviction that we have no reason to dwell in dilapidation and disarray under death, when Christ has knocked death off his seat. We have at the baseline an inexorable and pleasing shift to new habitation, an amazing and opportune provision for fresh occupancy within the divine house. The end of days is a necessary and ultimately happy exodus, pre-ordained by God, the Ancient of Days, to allow us to flee from our own misconceptions. This process is managed by Chirst, the arbiter of the Covenant of Grace, our providential means to divine acceptance. The holy proclamation of the great I AM in time and history is supremely exacting and clear in its message; we must all go. This eternally resounding act of toppling all the powers and principalities at Calvary, this act of rendering the law of sin and death terminally broken, means the stratagems and powers of death are defunct, obliterated for all time, though they still persist and confuse our world. The great tribulation, the end of times and the revelation of Christ is a logical and inevitable consequence of an eviction notice being served on the tenants of Adam at Calvary. They have to leave, every single one. The entirety of Adam’s sinful family needs to move house, from the crumbling ruins of Adam’s decrepit and defeated body, with its mistaken power regime, to accommodation in the stalwart and infinity-ready body of Christ. 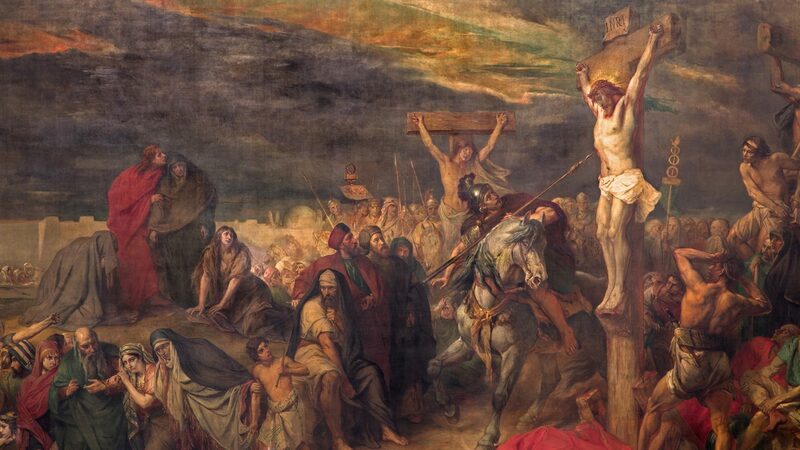 Christ crucified and risen is the road and pathway to a new and preferable domain in heaven, where we truly belong, with all Adam’s family goverened and chastened by the all prevailing light of Christ, lord and saviour of humankind, ever triumphant star of the universe. So, it seems, the resurrection of the dead (those who dwell in Adam; all of us) is imminent. Those who tarry in the bitter shadow of death, not knowing or seeing the baselessness of the prison, must be guided to Christ and ushered forth to quit the fetters of damnation and claim a proper place in heaven and a right relation with God. Adam himself is best placed to champion this evangelism and proselytisition. If Adam goes, we all go. Followers of Adam, descendants of Adam, those inevitably conjoined to Adam, must recognise the worthy character of the Christ that shines above him and within him, and claim their identity in Christ as a means to holy egress, and thereby see their father and leader in his true light, standing under the pacifying and luminous grace of Christ. It is time; the Lamb of God must reign as monarch to all. Adam must assist in fashioning imputed riteousness in his fold, the objective being absolute freedom from condemnation, comprehension of our underlying divinity and, looking forwards, unending rejuvenation in the invigorating and bountiful springs of the divine aethyrs. Highlighting Chirst with evangelical determination, such that His light connects with the souls of those in trouble, is the act that will set us free. Magnifying Christ and creating a devastating gospel vortex is what will allow us to finally quit Adam’s sorry reign and find a new era of harmony. It is not a case of Christ returning to us. It is a case of Adam returning to Christ and reconciling with Christ, who owns heaven. The prioroity, at this critical juncture, is to make Christ as obvious as possible. Forget everything else and point to Christ with utter determination, 100% of the time. Make Christ obvious. Period.